Discover Adventure Tours in Asia in August 2019, visiting places like Kathmandu and Hanoi. Book now and save with TourRadar.com! "It was a great experience for my first time travelling in Thailand. Although a very..."
"Me and my friend was AK's first travellers. She was the cutest, warmest and most..."
"Ryan was amazing, the tour was amazing and our group was amazing!! Would 110% recommend..."
"Great tour. Good number of inclusions and very active with a good amount of walking...."
"Genuinely had one of the best months of my life on this tour, mainly thanks to our..."
"it was great we saw a lot in 18 days. Some sights were rushed obviously you need..."
"Ratha was simply amazing! 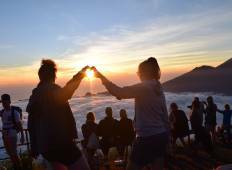 He made us feel so at ease so we could just enjoy the countries..."
"Shandy was a really good guide made everything we did really fun and exciting whilst..."